Strasse for Porsche in Leeds. Please use the links below to see our latest race results. 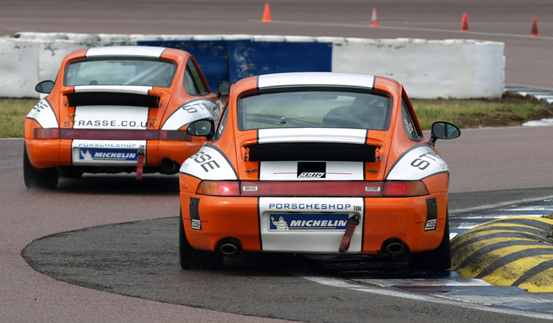 The Porsche Club GB Championship contenders had to deal with changing weather conditions all day as heavy rain rolled through the Corby region of Northamptonshire at Europe's fastest racing circuit Rockingham Speedway in the morning. 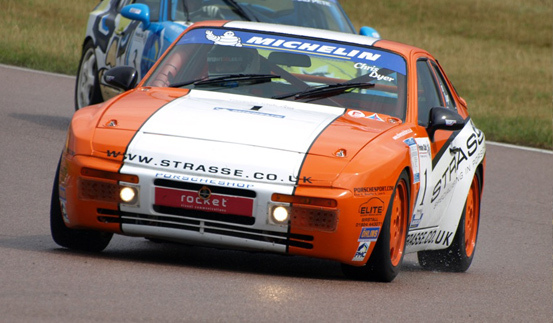 The team was back to full strength for rounds nine and ten with David Botterhill piloting the Strasse coloured Porsche 964 was back to join team mates Chris Dyer in the Porsche 944 S2 and Richard Ellis in the Porsche 993 C2 after missing the last two rounds at Thurxton. With only a 12 point championship gap heading into this weekends race, class 2 leader Chris Dyer was looking to close the gap on the overall and class1 leader Mark Sumpter and keep the contention of maintaining the the championship crown alive. Both drivers where on form taking pole position in there representative classes. Dyer also took the decision to take part in the GT3 Championship to enable him extra track time to get used to his first visit the Rockingham circuit, the decision paid off has his 994 exhaust snapped during the GT3 qualifying. Dyer brought the car back into the garage where the exhaust was soon welded back up ready for the first race of the Porsche Club Championship. With only two competing in the class two this weekend Dyer was more set on trying to mix it up with the class one contenders, opting for a wet set up but on dry tyres Dyer headed home the Class Two runners with a convincing win, finishing tenth overall and having run higher early in the race as he got amongst the Class One runners. Richard Ellis piloting the 993 C2 was on pace until a thrust bearing problem meant that he dropped off the leading pack struggling with the car crossing the finish line in 10th place. David Botterill had a trouble free race in the Porsche 964 finishing in 7th place. Chris Dyer..."It was very wet and I decided to got out on dry tyres, and the track got dryer and dryer has the race went on I managed to catch Richard Ellis and David Botterhill, I enjoyed the race and the decision to start on dries paid off, I was trying to get ahead of some of the Class One guys, It was a good race and fun to get amongst them hopefully it will be dryer for the second race and have a good go to get further up the grid". In sharp contrast to race one, the final round of the day was held on a dry track with the sun shining Dyer completed the double taking the Class win, Dyer was on top form and soon got up to 5th overall after tacking Richard Ellis who was struggling with gear box problems this soon developed into a multi-car battle for sixth place which entertained the fans for most of the race. Ellis who lost places from the start fought his way through the squabbling pack to take sixth, ahead of Koeberle and Dyer, Richard Higgins retiring from the battle. David Botterill who was also involved with the midfield battle came home in 8th place. Richard Ellis..."I got bogged down on the start and having problems with the clutch did not help got into second gear clutch stated slipping again and by this time every one had gone, I spent the next ten minutes catching up and getting the car going. The car was brilliant in the 2nd race, in the first race it was not that fantastic but it was improving for a wet set up, but the 2nd race the car was going great apart from the clutch issue, so looking forward to the next round and hopefully better results". Chris Dyer..."I got a good start and past about five cars, I had a bit of a coming together with Karim Moudi and got up to 5th overall and then dropped back a place to Richard Ellis, it was a brilliant race, I really like Rockingham I would like to come back here, It seems to favour the brave and you can carry the speed in these cars in the quick corners. It has been a good day for us we closed a few points on mark stumper but I liked Rockingham and at least it stayed dry for the second race, I really enjoyed it. Strasse are the North of England's leading independent Porsche specialists. Based in Leeds, Yorkshire. to Strasse unless otherwise stated.